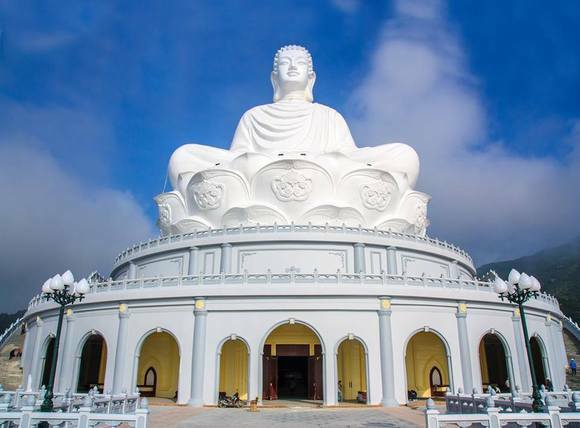 BINH DINH, Vietnam—Ba Sao Investment recently installed a complete networked audio system by HARMAN Professional Solutions at Linh Phong Spiritual Dharma complex. Located 400 feet above sea level amid Binh Dinh’s lush mountainous terrain, Vietnam’s Cat Tien National Park is home to the sacred Linh Phong Spiritual Dharma complex, which covers an area of 155 acres. Thousands of religious devotees make pilgrimages to Linh Phong to pay homage to ancient Buddhist traditions and worship at the foot of the 220-foot tall statue of Shakyamuni Buddha seated on a lotus flower, the tallest Buddhist statue in Vietnam. In order to ensure immaculate audio quality for meetings and lectures, Ba Sao Investment was hired to equip the Linh Phong Spiritual Dharma complex with a state-of-the-art networked audio system. Ba Sao selected a complete HARMAN networked AV system, comprised of solutions from JBL, Crown, Soundcraft, BSS and AMX. Ba Sao Investment met the challenge of distributing sound evenly throughout the large space by installing twelve JBL Control 12CT compact ceiling loudspeakers. Control 12CT speakers features a 3-inch driver mounted in a vented UV-resistant baffle, and its pre-attached backcan enabled the team to quickly and efficiently install the speakers in the 50-foot high ceiling. Ba Sao used Crown DCi DriveCore Install series amplifiers to supply clean and reliable power to the JBL Control 12CT ceiling speakers. To enable easy day-to-day operation and scalability for future expansions, Ba Sao designed the system around an AMX NX-2200 NX Integrated Controller. The team also networked the audio system using a BSS Soundweb London BLU-100, which offers a fixed configuration of inputs and outputs and a low-latency fault-tolerant digital audio bus, providing the building blocks of a perfectly tailored system solution. For mixing of input signals, Ba Sao included a Soundcraft Signature 12 console, which offers lots of headroom, superb signal-to-noise ratio and Sapphyre Assymetric EQ for shaping the frequency response or every vocal microphone and instrumental element.